Here is another part of my Halloween decor. I found the sheet music a few years ago at an antique store and couldn't pass it up. It has the name Leslie on the cover! Sorry about the reflection of the glass. 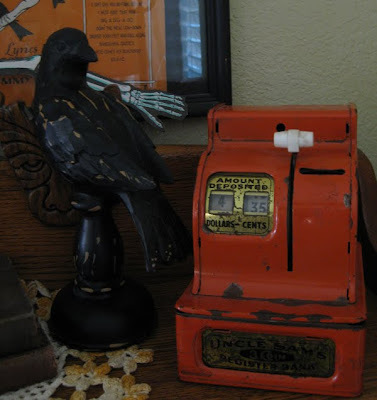 An old toy cash register bank. I love vintage toys. 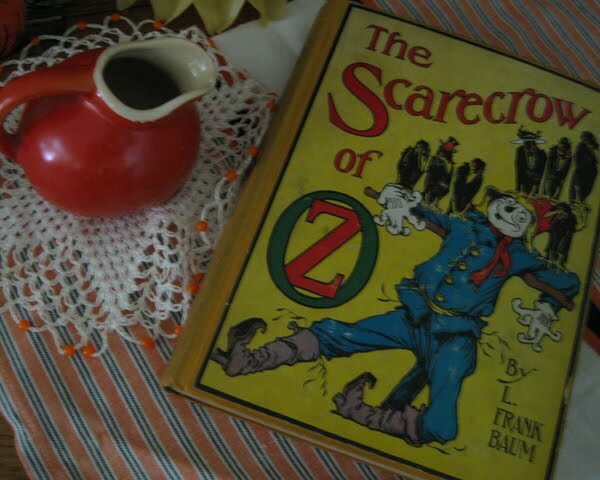 This was one of many Oz books that I got from my mother. 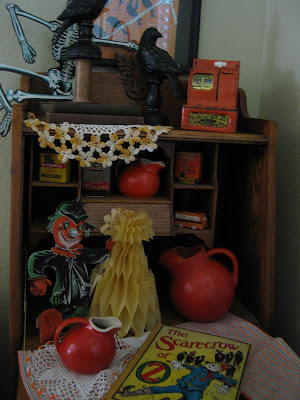 I have some spice tins, old crocheted doilies, orange pottery, and a few vintage paper things. 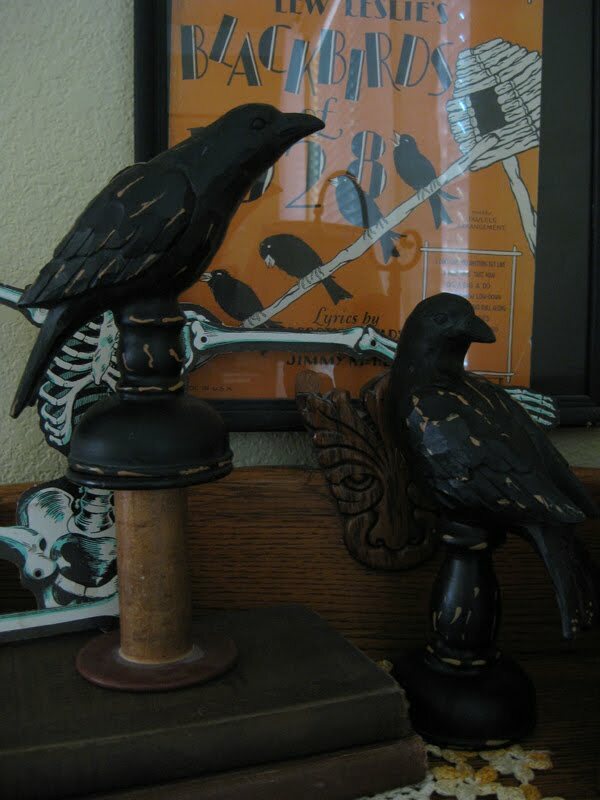 I hope you all are having fun if you decorate for Halloween. More to come later. Love the arrangement. 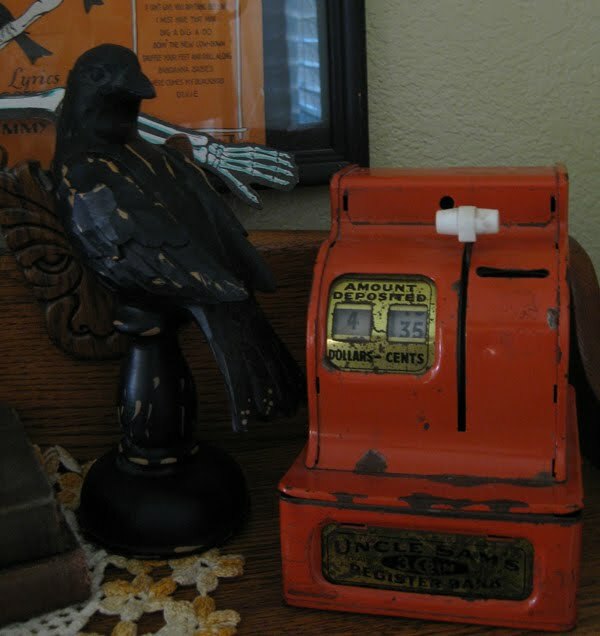 The Scarecrow book is perfect and the toy cash register adds to the fun. I like all your Halloween decor! You've made some cute stuff. I really love the primitive look with all the autumn holidays. I checked out your cute shadowboxes too. Such a clever one you are! You have a really great way of creating vignettes, Leslie! I wish you would come to my house and help me decorate because I am clueless. Your decorations are really great, and I especially like how you mix fun little antiques in with it! Very cute vintage Halloween look. I escpecially like the honeycomb corn stalk with the scarecrow. O MY!! I just adore this Halloween display!! So unique! !